This Kesar Pista Kulfi Recipe is a treat to your taste buds. Made using reduced milk, saffron, cardamom and nuts, this homemade Kulfi recipe is sure to please your palate. Here is how to make Kulfi Recipe at home. When I started blogging, I had no clue how much excitement it would hold. I was always trying out new recipes, and blogging looked like a good option to document them. But now it has become a part of my life. I look forward to trying new things so that I could share them with my Whisk Affair family. I have tried to improve a lot on my photography and in the process, I have learned so many interesting things which I would have otherwise missed. It has been a wonderful journey and I hope I’ll keep blogging and keep improving in the years to come. Recently, we have unlocked one more achievement, and there is no better way for me to celebrate this wonderful milestone than with a traditional Kesar Pista Kulfi recipe to enjoy this moment. So without wasting any time, here is a delicious Kulfi recipe for you guys to enjoy :). 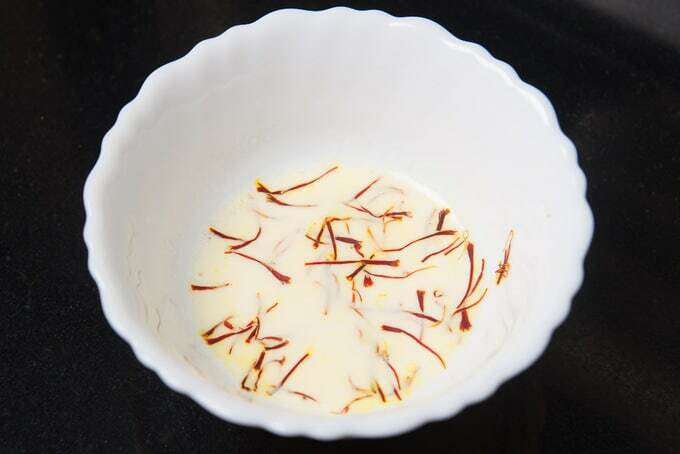 You might also like Thandai Kheer, Lachcha Rabdi and Basundi. How is Kulfi different from Ice Cream? Kulfi is an Indian version of ice cream which is made using thickened milk, saffron and is loaded with dry fruits. The sweetness and the earthy flavours that comes by thickening the milk makes this dessert irresistible. It is denser than ice cream and hence it does not melt as fast as ice cream does. Made with pure saffron and freshly ground pistachios, it is perfect for dessert during the summers and is healthy too! With all the dry fruits and Kesar used for making it, this dessert makes you feel nothing less than a royal. 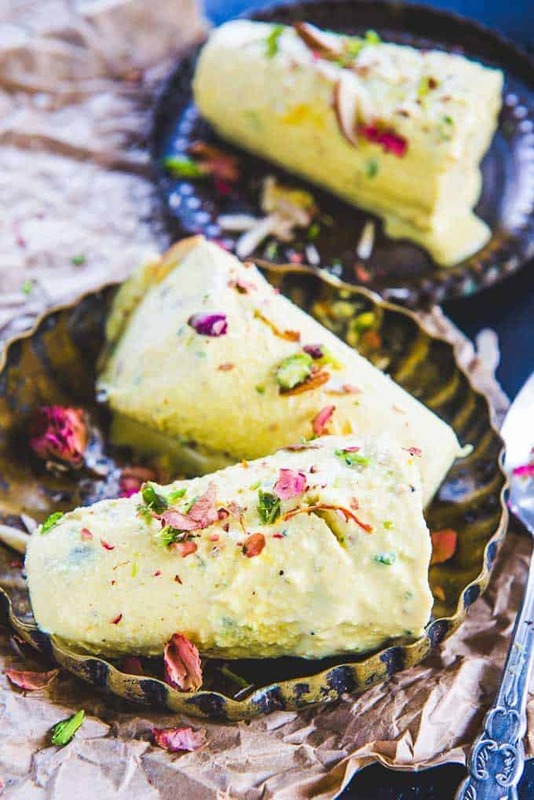 Traditionally kulfi is flavored with cardamom and saffron but these days people have started to make variations of this delicious dessert. You can mango puree to the mixture and make Mango Kulfi or add some pureed strawberry and make Strawberry Kulfi. I have also come across Paan Kulfi, Chocolate Kulfi, Pineapple Kulfi etc. Make sure to use full fat milk to make it. 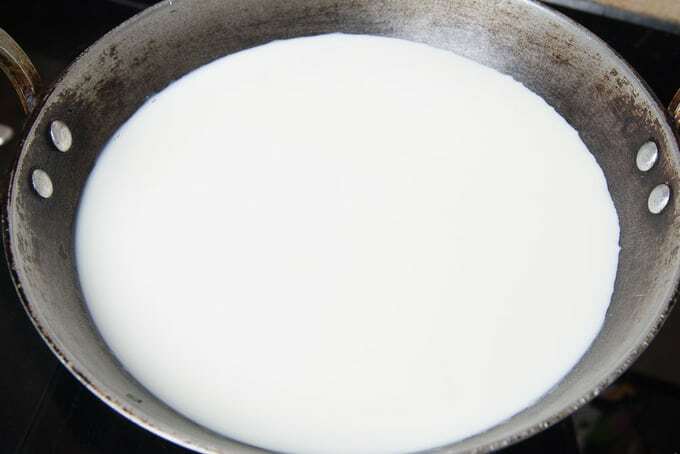 Reduce the milk on medium low heat. It will prevent it from burning at the bottom. Keep stirring continuously while reducing the milk to prevent it from burning. Use a heavy bottom pan to make Kulfi. You can add flavourings of your choice and make Mawa Kulfi, Mango Kulfi or Paan Kulfi instead of this. Even Chikoo Kulfi and Guava Kulfi are getting very popular these days. You can add khoya in my recipe and fasten the thickening process keeping the taste intact. Serve this dessert with falooda which is a very popular combination. Boil the falooda until softened and top the kulfi with it. Falooda comes in various flavours these days. Saffron is my fav. You can also top this kulfi with syrups like rose, khus etc. Set the kulfi in fun moulds to make it exciting for kids. 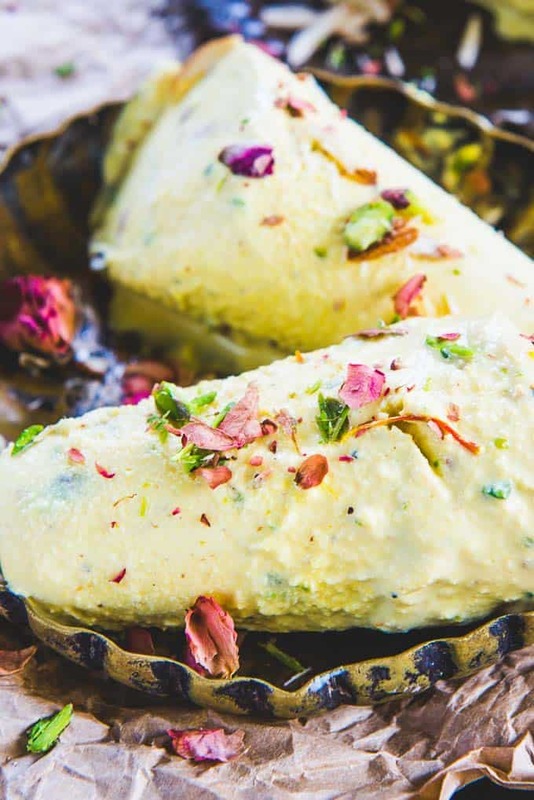 If you like your kulfi creamy and not pieces of malai coming in your mouth, blend the thickened milk in a blender once it has reached to room temperature and then pour it in the moulds. Do not blend the cold milk otherwise butter will separate from it. How to make sure Kulfi doesn’t have Ice Crystals? 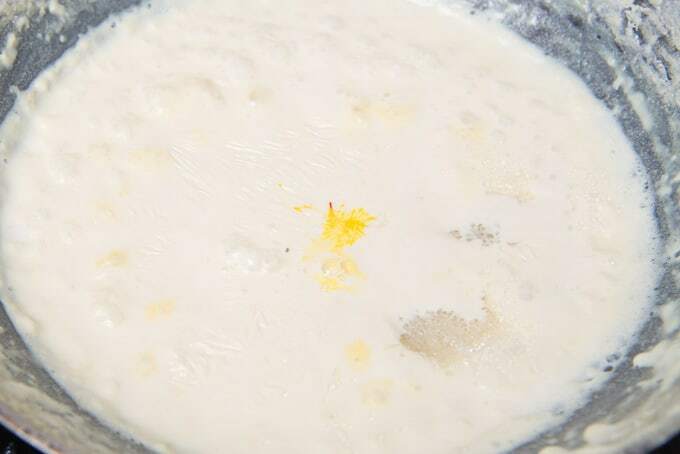 Thickening the milk well reduces the formation of ice crystals in kulfi. Make sure the mixture is properly cooled before you pour it in the moulds. Close the lid of the mould tightly to avoid formation of ice crystals in the kulfi. Also make sure to freeze the kulfi at the lowest temperature possible. For best result, empty the freezer as much as you can before freezing kulfi so that the chances of ice crystal formation are very low. 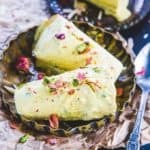 How to make Kulfi with condensed milk? You can add condensed milk in this recipe and make the process of thickening the milk faster. Just add 1 cup of condensed milk in the below recipe once the milk has reduced to half and skip the sugar. You can taste the mixture once the milk is reduced to desired consistency and then add some sugar if necessary. How to make Kulfi using bread slices? If you are in a hurry, adding a few bread slices soaked in milk reduces the thickening time of kulfi. Just remove the corners of the bread and soak it in some milk. 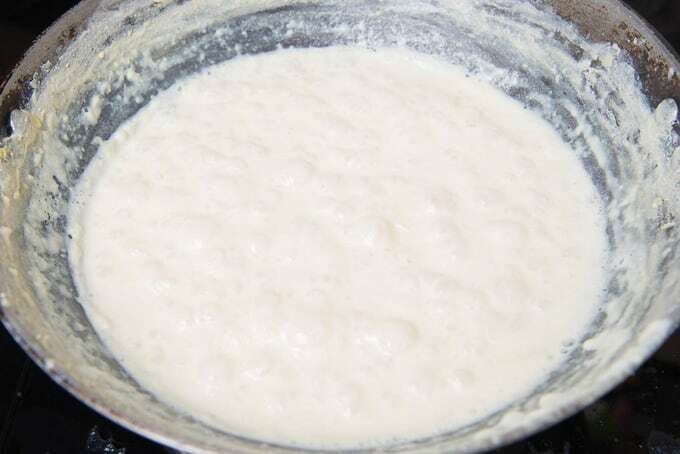 Mash it after 15-20 minutes and add in the reducing milk. It also helps in reducing the ice crystal formation in kulfi. Add the milk in a heavy bottomed pan. Bring to a boil. Let the milk simmer on low heat, till it has reduced to 1/3rd. Add the saffron soaked in milk, sugar, pistachios, rose water and cardamom powder and mix well. Remove the pan from heat and cool to room temperature. Fill the thickened milk in the kulfi mould and freeze overnight. This Kesar Pista Kulfi Recipe is a treat to your taste buds. Made using reduced milk, saffron, cardamom and nuts, this homemade Kulfi recipe is sure to please your palate. Here is how to make it. Add the milk in a heavy bottomed pan. Let the milk simmer on low heat, till it has reduced to 1/3rd. Add the saffron soaked in milk, sugar, pistachios, rose water and cardamom powder and mix well. Remove the pan from heat and cool to room temperature. Fill the thickened milk in the kulfi mould and freeze overnight. To remove the kulfi from the mould, dip the mould in warm water and pull out the Kulfi. Drooling over this much wanted desert to beat the heat!! Really super virtual treat and the kulfi is tempting too much.Drooling here. congrats dear..beautiful clicks,wish I was your neighbour..yummy!! Hi. This ice cream looks delicious. Just one question, is it really 14 cups pistachios? Shenaaz. It’s 1/4 cup. There is some problem in the coding. Fixing it very soon. I tried ur recipe, have 2 doubts. 1. The sweetness was little less and to make it more rich, I added 100ml of condensed milk and 3 tsps of powdered sugar at the end and mixed well. the sweetness seemed to be comparatively lesser after the mixture was frozen. Is there anyway to improve the richness and get rid of the ice crystals, solving these 2 issues i feel would make it more closer to the store bought ones. THE BEST WAY OF MAKING kulfi.